Each summer’s featured film helps viewers learn more about advocating for the environment. Attendees gather at dusk for cocktails from the donation Bird Bar and are encouraged to stake out preferred seating and enjoy the live music courtesy of community partners such as Raffa Jo. Dinner is dished by an award-winning food truck. When night falls, the film rolls. If the weather proves inclement, the festivities take place inside the historic Doc Thomas House. 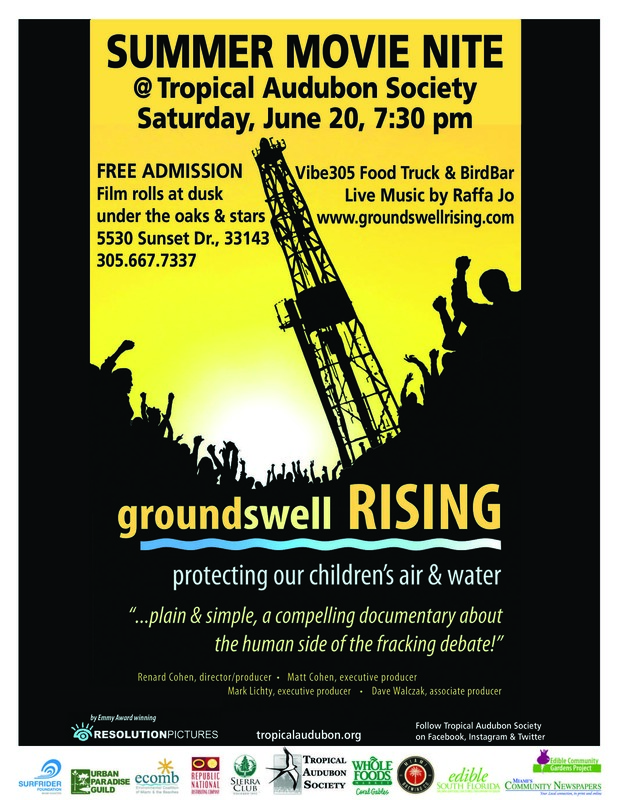 Summer Movie Nite is intended to educate, inform and raise viewers’ environmental awareness. Early birds get the worm: Arrive prior to nightfall to better assure a prime seat. Admission is FREE: To help TAS offset the costs of staging and staffing Movie Nite, donations are welcome! Parking: Limited free on-site parking via our 55th Avenue gate and along 56th Avenue; metered parking on Sunset Drive; various garage and valet parking options within 1-3 blocks; Metro-rail service to South Miami Station.